Carlsbad, California – Osiris is proud to announce the launch of its latest commercial campaign, We Are Osiris, airing on MTV and FUEL TV beginning today. We Are Osiris, subtly infuses iconic Osiris athletes, a graffiti artist and a rapper through notable action clips that tell the brand story in a unique documentary style – all in 30 seconds. “Since this is our first TV commercial campaign we really wanted to portray the brand in the most authentic manner and do it right, said Brian Reid, Osiris Co-Founder/CCO. The We Are Osiris campaign starts off with a bang featuring Corey Duffel riding through the streets of San Francisco on a motorcycle and transitions to him skateboarding down one of San Francisco’s notorious steep streets in North Beach. Pierre-Luc Gagnon (skateboarder), Darryl Tocco (BMX rider), Risk (Graffiti Artist) and Del The Funky Homosapian (Rapper/ Producer) are also featured in this purely authentic commercial. Osiris Shoes Network will exclusively feature extended sequences from the commercial by releasing a series of behind the scenes videos, photos, exclusive interviews, and contests in a new video section on the website – www.osirisshoesnetwork.com. Make sure and check back every week for fresh extended videos of each of the featured athletes by visiting www.osirisshoes.com. 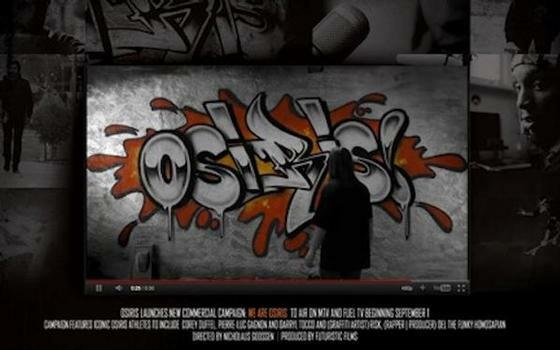 To view the commercial and extended footage visit www.osirisshoes.com. Stay tune for more on this exciting project in the very near future. Osiris was created in 1996 by the executive team of Tony Magnusson, Tony Chen, Doug Weston and Brian Reid. The Osiris brand was born out of a need in the market for quality skateboarding footwear that also incorporated lifestyle street elements. The executive team combines over 50 years of footwear, design and product knowledge with over 70 years of combined experience in the action sports industry. This combination of experience has allowed Osiris to be one of the premier action sports footwear brands worldwide for over 15 years. Nicholaus Goossen was a first-time feature director at the age of 26, making the cult-classic "Grandma's Boy" for Adam Sandler. He is currently working on short form as well as his upcoming Comedy Central show. His recent work includes clients such as Yahoo! Vitamin Water, Dish Network and Pentax, and he has also directed a number of music videos for Mickey Avalon, Shwayze, Benji Madden, Dirt Nasty, Andre Legacy and Adam Sandler. Goossen has millions of hits on YouTube and Funny Or Die. Futuristic Films creates motion pictures of all shapes and sizes for brands, advertising, and entertainment. Founded on the idea that the evolving nature of media consumption demands an equally evolving approach to film and video production, Futuristic's work blends the intense creativity of commercial filmmaking with the substance and storytelling craft of documentary and feature film. Futuristic has offices in Denver and Los Angeles and represents a diverse and talented group of directors, producers, editors, and VFX artists, delivering outstanding and award-winning work for partners and clients.